Aside from this being labeled as the question I most ask myself on my okCupid profile, it is what I grapple with as I begin my thesis year. I come back to HSR interviews and lessons when creating characters real stories. They ask questions about travel like Olivia, or question their gender like Tanika, or have buried a lot of pain like Jasmine. Finally the Her Saturn Returns Zine series will debut at the Black Lesbian DIY Fest in Brooklyn, held at the Lesbian Herstory Archives on Saturday, Oct 13th, 2014. 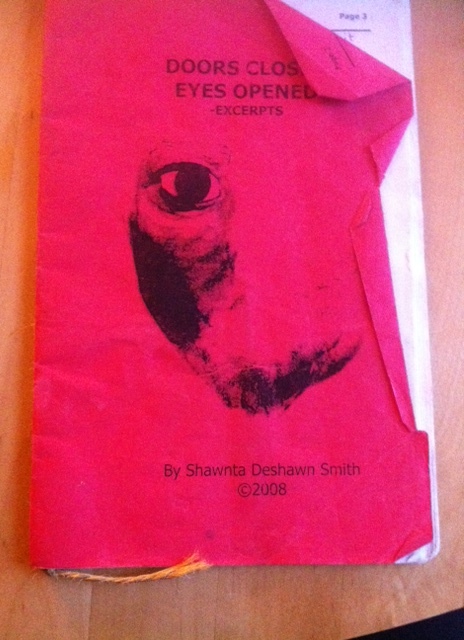 Throwback Zine from six years ago – will be on my table along with the HSR Zine – very excited! Fiction is the biographer telling her own story, using her own voice as a tool to tell a particular truth filled with known worlds, characters that she holds close, in places that she has studied and developed as her own. Fiction is the transcription by the oral historian who notes that words held on the digital recorder are sound waves that can be distorted, that the final edit of this piece will have names spelled differently, will have dates lining up incorrectly, and adjustments in who said what, time-lining memories with accuracy. Lorde named Zami a biomythography. Fiction is the Memoir that gives permission for the voice to wave sounds, in a timeless, spaceless, boundlessness. I tell the story as I tell it. I transcribe the story as I hear it. I write the truth as I know it. I know the story as I truth it. I truth the telling if I write it. I write what I know, this story I tell. My memoir is fiction, I have resolved. Gallery | This entry was posted in Informative and tagged Black lesbian writers, black lesbian zines, black lesbians, fiction, memoir, writing memoir, zines. Bookmark the permalink. Thank you John, I am currently reading Orlando, and found Virginia Woolf speaking to me once Orlando was transformed into a woman. Woolf writes, “She began to think was Nature beautiful or cruel; and then she asked herself what this beauty was; whether it was in things themselves or only in herself; so she went on to the nature of reality, which lead her to truth, which in turn, led to Love, Friendship, Poetry…” (107). It seems there is something connected to the truth and the written word and its’ realness throughout time. What an ideal read for your quest, Orlando! In many ways, seems a memoir masquerading as fiction, no? I’ve often thought that those who hail Orlando as ahead of its time because of its gender fluidity, its sexual fluidity, are perhaps missing (at least for me) what is the real reason it was ahead of its time — which is that it is in reality hailing womanhood, being female. Hailing its power, its importance; i.e., pride in being a woman. Celebrating femaleness as the center of–, well, the Milky Way galaxy. She wants to be female. Being female is natural. Being female gives her a center. Would that the world today understood and appreciated that femaleness is the true center of who and what and why we are; each of us.. Enjoy and revel in your journey!